So, lest you think I have been really lazy, I really have been working on our bathroom since my last post. It is just taking THAT long. 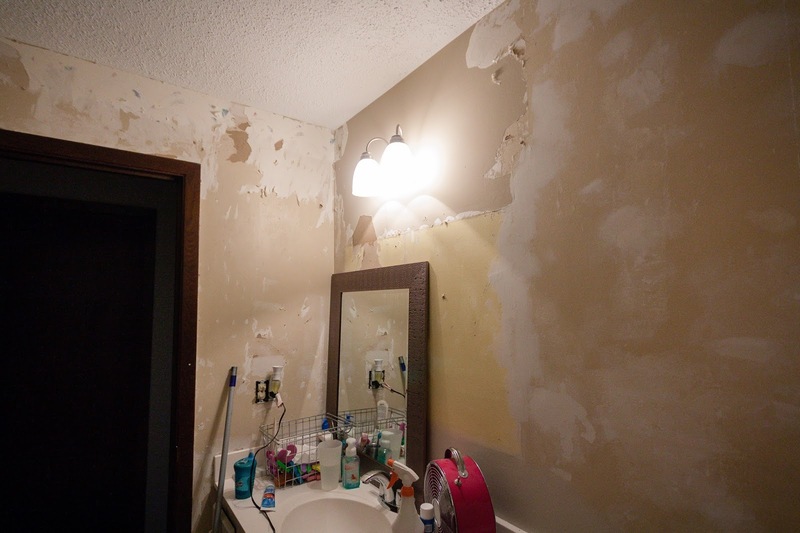 Removing the wallpaper in this room was a HUGE, EPIC mistake. The drywall was so compromised by the moisture trapped behind the paper that it just tore apart no matter how we tried to remove the paper. It is really really bad. I also had to use a razor to cut all the caulk away from the edges of the counter and shower tiles, which took forever. The walls are so bad, that I'm considering not removing the section around the light and just skim coating it so you can't see the line of the wallpaper border. I managed to clean up the area behind the toilet enough to paint it so we could get our new toilet installed. The wall color is a very safe, boring greige..BM Natural Cream. I just wanted it to look fresh in here, so light and neutral it is. The Behr paint sample actually covered in one coat, I was impressed. The toilet is the Kohler Cimarron, it looks really nice and was pretty inexpensive. Our amazing friend drove all the way from Racine to put it in for us, along with a shiny new faucet that I didn't take a good photo of yet. 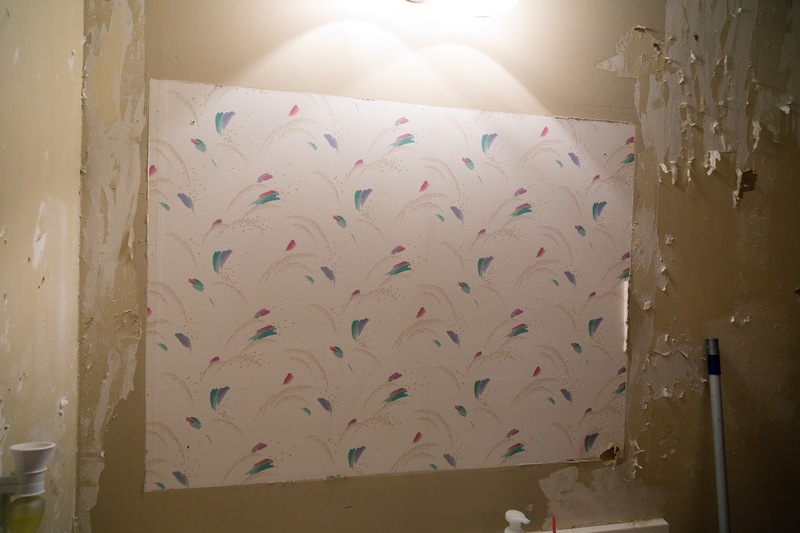 Here is a shot of the awful wallpaper before we removed it from behind the mirror. Thank goodness it wasn't glued onto the wall! Because of all the damage to the drywall on the walls, we've decided to just leave the popcorn ceilings. I have no idea what we would do to the ceiling if we try to scrape it, and we are just so over this mess. I think it might be weird to have a smooth ceiling in just one room of the whole house, too. My plan is to put some joint compound over the worst of the bare drywall spots tonight, then sand those smooth tomorrow and do a full skim coat over everything afterwards. Wish me luck! Your walls look just like my first job of taking wallpaper off. Then I discovered this handy tool at Lowe's. Piranha Wallpaper Scoring Tool. I use a weed pumping sprayer. I fill it with hot water and vinegar. Last I have a steamer. I have no idea where I got it, but it has a bunch of attachments. For cleaning mirrors, showers, whatever... After lightly scoring the wallpaper with the doohicky, I spray it with the vinegar and water, which helps soften the glue, smells bad, but gets the job done. I'll run my steamer in a small section.. And slowly work from top to bottom pulling the paper with one hand while my steamer is guiding the way underneath with the other hand. Does that make sense??? If you have any more wallpaper, try it this way!! Oh yuck. 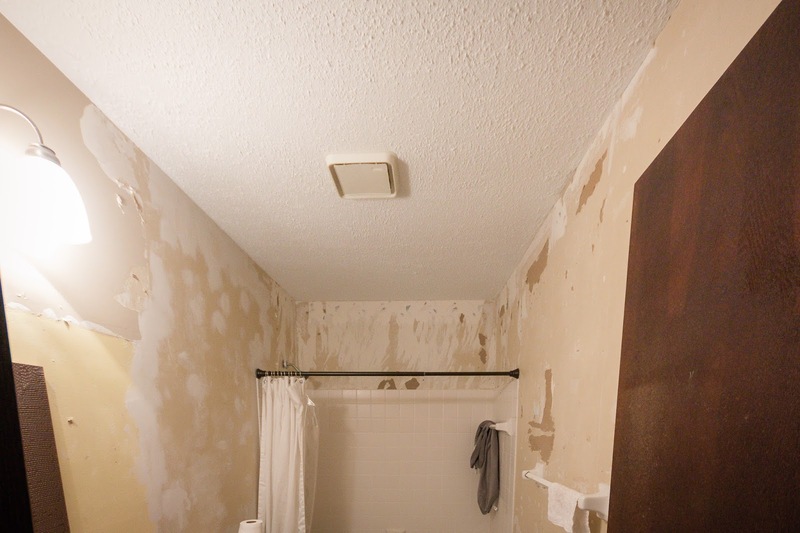 I completely understand - when we removed the wallpaper in the kitchen in our last house, i honestly got to the point where i considered just removing all of the drywall and starting over. i swear it was attached with super glue. in layers. and it was on the ceiling. it will be worth it though, hang in there! This is what my dining room wall looked like after I ripped the wallpaper down. What are you going to do? Patch and sand? I didn't know what to do, so I just, uh, put the furniture back and have been ignoring it for about 2 months. I might texture it (the other walls are textured) but haven't decided whether to attempt to DIY that or not. Sara, I feel your pain. My 1966 Cape was full of wallpaper. I removed it all. The Dining Room had 5 f-ing layers. It will look great when done. Persevere. We have tried a steamer, but not a weed sprayer. Any additional water on the drywall just makes the problem worse because it's already so moisture damaged. 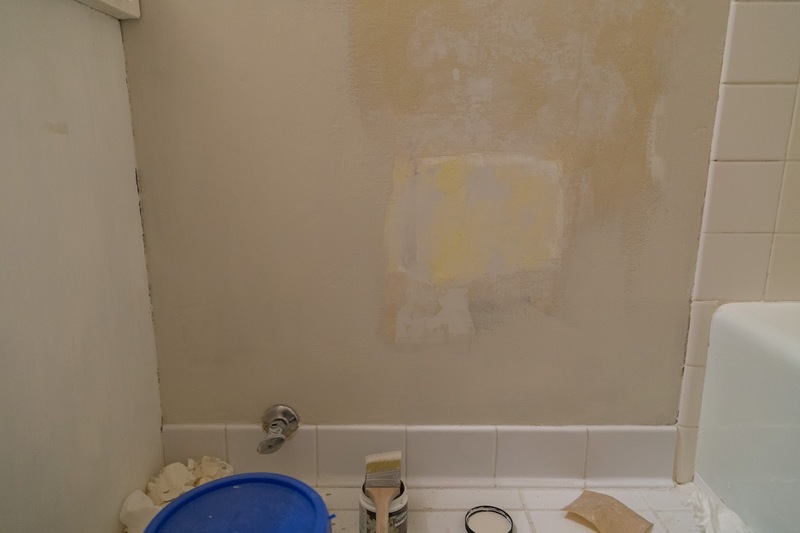 I think I'm to the point where I can start spackling the bad spots, then I will put a thin layer of compound over every wall. OMG, this will take forever!! ugh! that happened in the bathroom of our first house and i lived with it half torn for so long because it was just so hard and awful and i didn't know what to do. i eventually texturized the walls only because i needed to cover it up. OMG this is a total nightmare. 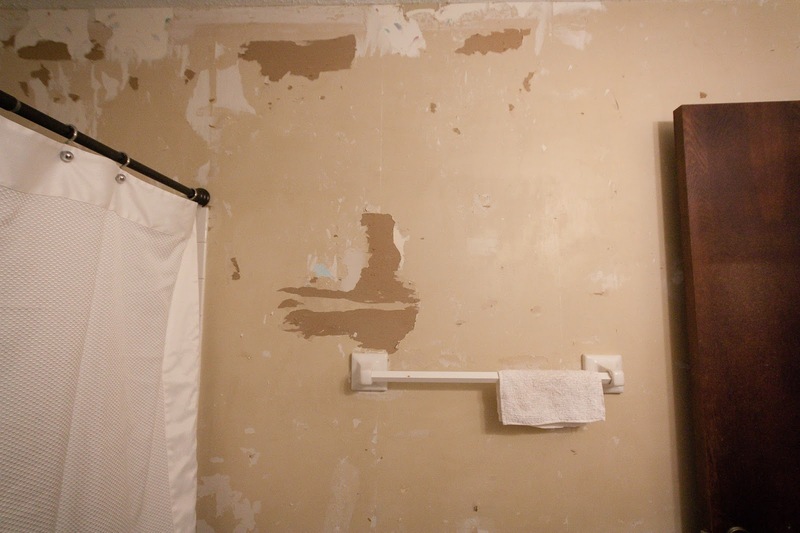 Can you believe that I've never had to deal with removing wallpaper? I don't know how that happened, but I'm thanking my lucky stars right now. I am horrified at what you're going through! But I've seen enough of your blog to know that your bathroom will look amazing when you get it done. Hang in there! 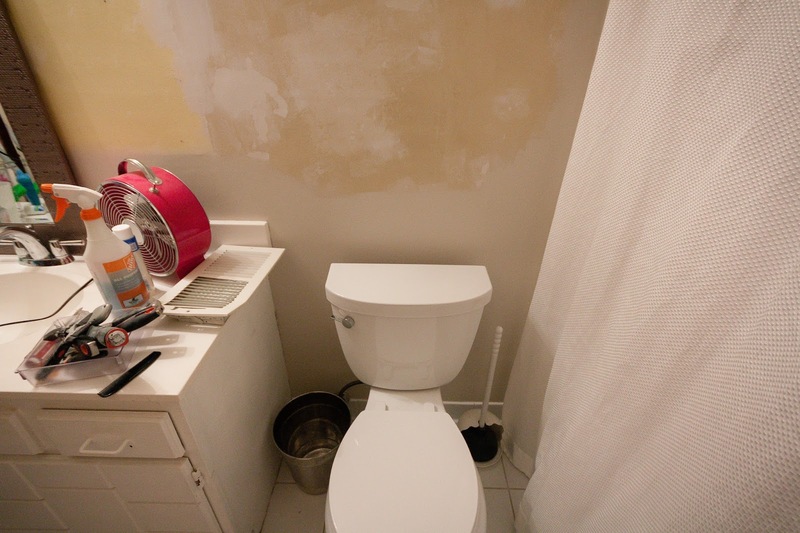 I am so afraid to start our first bathroom reno because I'm afraid of the surprises we'll have. Your resilience is inspiring!